We are helping to establish safer and more complete networks for travel of all types, including walking, cycling, and public transit. Ready? Let's go! A top strategy for Groundwork Atlanta is working collaboratively with communities and partner organizations to plan and begin implementing a multi-use path network in the City of Atlanta that connects local and regional greenspaces, as well as neighborhoods and destinations throughout metro Atlanta and beyond. Two key projects included in this network are highlighted below, but we are also advocating and planning for access between these facilities and nearby neighborhoods, parks, and other regional paths, such as the Silver Comet Trail and the Atlanta BeltLine Trail. Groundwork Atlanta Board Members Keith Sharp and Kathy "Riverside Kate" Hearn have spearheaded the effort to increase access to the Chattahoochee River in the City of Atlanta through Riverwalk Atlanta, in partnership with the Trust for Public Land and Groundwork Atlanta. 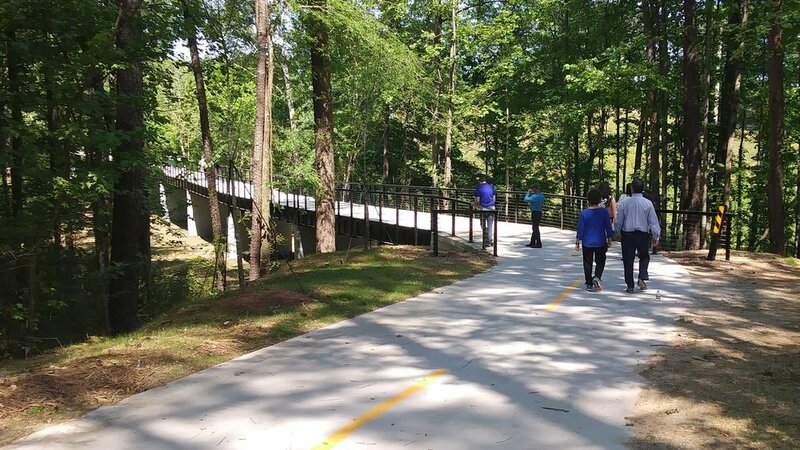 Our collaborative efforts have resulted in planning, property acquisition, and clearing of pathways along the banks of the river, and we are continuing to work together towards development and construction of a paved greenway path for this section of the Chattahoochee. Groundwork Atlanta joined local leaders in celebrating the recent completion of Phase 1 of the Proctor Creek Greenway, and we look forward to working with the City of Atlanta, NPU-G, the U.S. Environmental Protection Agency, Proctor Creek Stewardship Council, West Atlanta Watershed Alliance, Emerald Corridor Foundation, and other partners to extend this path to the Chattahoochee River (with connections to the planned Chattahoochee River Greenway) and support ongoing maintenance of this facility.